Starred reviews from Kirkus, Booklist, and Publisher’s Weekly. Stunning close-up photography and a lyrical text invite us to look more closely at the world and prepare to be amazed. What would happen if you walked very, very quietly and looked ever so carefully at the natural world outside? You might see a cricket leap, a moth spread her wings, or a spider step across a silken web. In simple, evocative language, Helen Frost offers a hint at the many tiny creatures around us. And in astonishing photographs, Rick Lieder captures the glint of a katydid’s eye, the glow of a firefly, and many more living wonders just awaiting discovery. Fascinating facts about all the creatures are included. Rick Lieder is a painter, photographer and illustrator in Michigan. Helen Frost is the author of many novels-in-poems for children and young adults. She lives in Fort Wayne, Indiana. 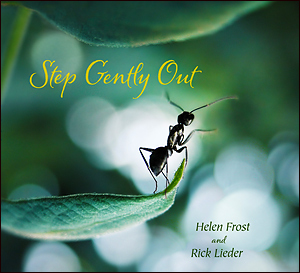 Step Gently Out is the first collaboration between Rick Lieder and Helen Frost. Their 5th picture book will be published Spring 2019. Nice news! Step Gently Out has been nominated for the 2014-2015 Star Of The North Picture Book Award. The Star of the North Picture Book Award was established in 2013 under the auspices of the Minnesota Youth Reading Awards. The purpose of the award is to promote quality, engaging picture books and reading for pleasure among school-aged children. American Library Association chooses Step Gently Out a 2013 Notable Children’s Book for all ages. “Open up the book Step Gently Out and enter quietly into a big world of tiny insects. Our first review is in, and it couldn’t be better! “Breathtaking photos and an exquisite poem capture a bug’s-eye view of nature. One can only hope the present collaboration will be the first of many between nature photographer Lieder and Frost (Hidden, 2011, etc. ), one of the most gifted, versatile children’s poets writing today, for the synthesis of word and image in this short picture book is so finely wed that the final page turn leaves one begging for more. While Frost’s lightly rhymed declarative verse encourages children to experience the natural world with care and openness to the tiny wonders of insect life around them, Lieder’s richly colored intimate close ups offer every reason why. Golden-hued endpapers catch a honeybee and firefly mid-flight; the volume also spotlights the less-frequently spied praying mantis, katydid and damselfly, alongside more common insects. Another great review, a starred review from Publisher’s Weekly! Working in concert, the words and images achieve a Zenlike calm that also hints at the complicated web of life unfolding all around. A 3rd starred review, from Booklist! “My favorite moment of the whole month of Poetry Madness happened on Friday when the last group of 2nd graders was examining the chart. Many were cheering about Loose Leashes. Others were looking back at the books that didn’t make it, talking about the ones they wished had gone farther in the bracket. “This book does not disappoint. While I am pro-animals, I sometimes have a hard time identifying with insects…and this book made me really appreciate and love these tiny, voracious creatures. I love how the photographs in the book really bring the reader up close and personal with these insects. Even more, I love how the text magically causes the reader to slow down and marinate in the words while taking in the photos of these insects. “STEP GENTLY OUT not only fosters a love of poetry but also of the creatures it describes. It shows passage of time and the behavior of some of our most populous occupants of the planet. It can be used to celebrate National Poetry Month or on any day of the year. It is one of those rare picture books where the text, art, and design merge seamlessly together to create a spectacular book.” – International Reading Association: Anita’s Picks. Wonderful! Step Gently Out nominated for the 2015 Bill Martin Jr. Children’s Picture Book Award. This award has been in existence since 1996 and honors renowned Kansas Author Bill Martin, Jr. It also commends outstanding authors and illustrators, promotes an appreciation in literature for young children, and encourages involvement in promoting quality picture books. “A while back, A Fuse #8 Production wrote an excellent post about the fact that there has never been a Caldecott Award or honor book comprised solely of photographs. I offer Step Gently Out for your consideration. The work of Michigan native Rick Lieder shines, beautifully interpreting the text and creating some thrilling moments along the way. “A beautiful new picture book, Step Gently Out, celebrates this moment for children – the wonder of watching animals, looking closely at their world and ours. Lieder’s photography will be the first thing to grab children’s attention. Each page brings the reader up close to an insect, as if you were right there crouching in the garden. The Fort Wayne Museum of Art showcased Step Gently Out with a multimedia presentation, book signing and opening reception for an exhibition of the images from the book in the Edward D. Auer Memorial Art Library. “Rick Lieder’s amazing photos bring this world alive. From bees to praying mantis and ants to fireflies, Lieder’s photos capture the grace and beauty of these tiny animals. “The poem tells a story of slowing down, looking carefully, and appreciating the natural world. The oversized insects allow the reader to imagine what it would be like to be one. The flyleaf tells the reader that Rick Lieder is a photographer, painter and illustrator. And many of us know, from her previous books, that Helen Frost is one heckuva poet. I hope the Caldecott Committee will step gently out of the box and consider this one.” – Calling Caldecott – Robin Smith.